You won't believe why the Old Lady swallowed a cow, some hay, a pig, a duck, a horse, a sheep, and a fiddle! There was an old lady who swallowed a cow. I don't know why she swallowed a cow but she did it somehow! You won't believe why this old lady swallowed a cow, some hay, a pig, a duck, a horse, a sheep, and a fiddle! The latest addition to Scholastic's bestselling series by Lucille Colandro and Jared Lee is a fully illustrated board book, perfect for the youngest readers. 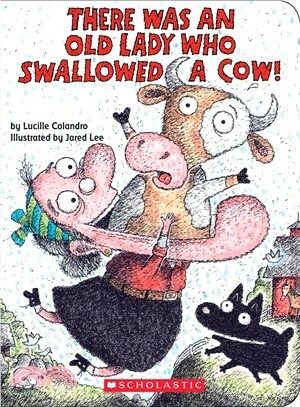 Lucille Colandro has written many books for children, including the bestselling There Was an Old Lady series illustrated by Jared Lee. Jared Lee has illustrated more than one hundred books for young readers. He has received awards from the Society of Illustrators, the Martha Kinney Cooper Ohioana Library Association, the National Cartoonists Society, and others. He lives in Ohio with his wife and a menagerie of dogs, cats, ponies, ducks, and a few unknown creatures.